My boys are big fans of Marvel Avengers ever since seeing the movie at the end of last year. So after getting an Xbox 360 for Christmas, they were doubly excited to play the new Ubisoft Marvel Avengers game – Marvel Avengers Battle for Earth ($44.79 on Amazon with free shipping). Fight together or fight each other but this game is really cool using the Kinect sensor. You are the hero – pick from any of the Marvel superheroes (my boys favorite is Hulk, of course!) There’s 20 different ones to choose from. And maybe I’m trying to justify the whole video game thing but I really like this one because they jump around and keep it active with it! 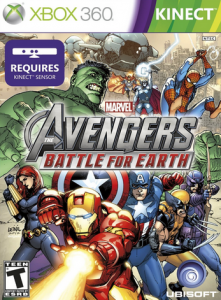 Get Marvel Avengers Battle for Earth ($44.79 on Amazon with free shipping). say about this article, in my view its actually remarkable for me. Hi, i think that i noticed you visited my blog thus i got here to go back the choose?.I am attempting to in finding things to enhance my website!I assume its good enough to use some of your concepts! !